Borth Station Museum Museum - TransportBorth Station Museum is a new and fascinating community heritage centre, where you can wallow in nostalgia for the heydey of the railways and those happy holidays by the sea. The collection of artifacts includes hundreds of items collected by volunteers over the years as well as donated items from supporters' own collections. The Station Manager's Office is where you'll usually find Siencyn (welsh for Jenkins), a local cat who has given his own seal of approval to the station museum. This is also where you'll find the Borth Station Volunteer team who are ready to answer any questions you might have, or give you an impromptu tour of the facility. 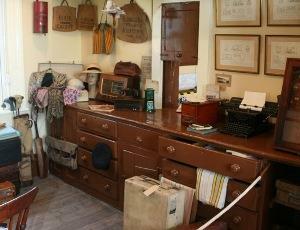 Souvenirs of Borth museum are available here, all proceed of which go towards upkeep and maintenance of the museum.